During the 2013 Daytona Bike Week Indian® Motorcycles unveiled their next generation of Indian® motorcycles including the 2014 Chief® Classic, Chief® Vintage, and Chieftain® models. Since this release Indian has continued to expand their line up with additional models and the popular Dark Horse design. With Polaris Industries pushing the brand, more and more riders are considering what Indian® has to offer. Indian® Motorcycle has steadily grown in sales and brand recognition since its asset purchase by Polaris Industries in 2011. In a declining market, Indian® seems impervious. In fact, retail sales in North America rose a staggering 17% just since last Spring and Indian® now accounts for a staggering 16% of the portfolio of its parent company. Don’t worry about finding a local dealer, either. Polaris President of Motorcycles, Steve Menneto, plans to grow their dealer network to more than 300 in North America alone! Indian® riders have the same desire most riders do. Customizing their ride with aftermarket exhaust, handlebars, and lighting products is a must. 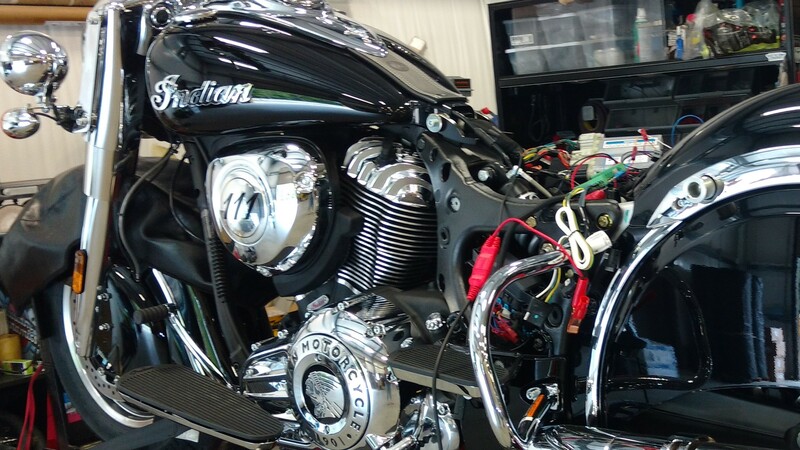 Due to the electrical system found on Indian® models, only a few aftermarket products are available. But, Custom Dynamics® is hoping to change that! The Vehicle Control Module (VCM) controls the newer CanBus Indian® models. The VCM requires a separate ground for every function. As a result, most lighting products/electrical modules on the market are incompatible. So, Custom Dynamics® purchased a 2017 Indian® Springfield™! First, there was product development and testing. Our engineers got straight to work! We had to learn the electrical parameters of the Indian®. Next, we had to identify any current product modifications we could make for Indian® compatibility. A big project to say the least! 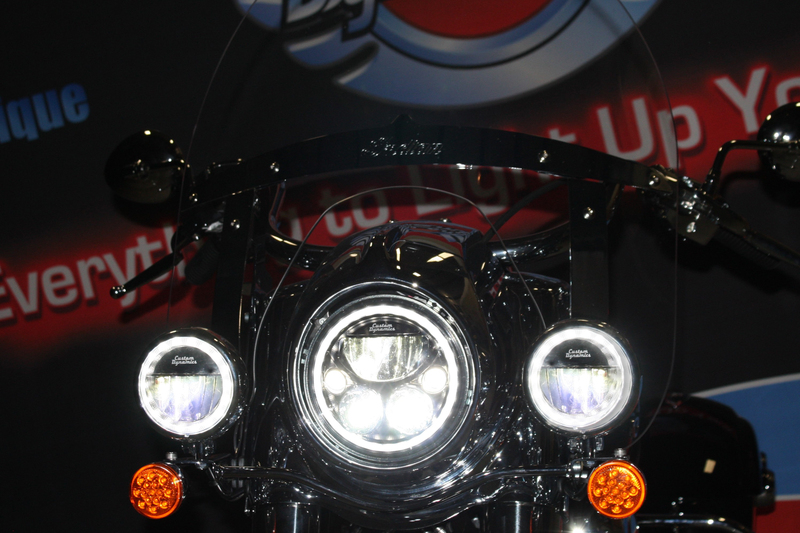 Custom Dynamics® TruBEAM® LED Headlamp and Passing Lamps are now being offered for 2014-2018 Indian® models (except Scout) with other products in the works! Complex reflector design with 3 low beam LEDs and 2 high beam LEDs. Combination of projector and reflector type LEDs for maximum light output. Built in DRL halo ring. Plug and Play Installation with H4 Plug. Optional Hi-Lo-Halo Adapter is required to enable internal DRL halo rings. To maximize light output, use the same Hi-Lo-Halo Adapter to keep the center headlamp low beam on when the high beam is activated (sold separately). Pair with Custom Dynamics® 4.5″ TruBEAM Passing Lamps for Indian! Moreover, for more information call Custom Dynamics® toll free at 1-800-382-1388, or contact your local Drag Specialties dealer. 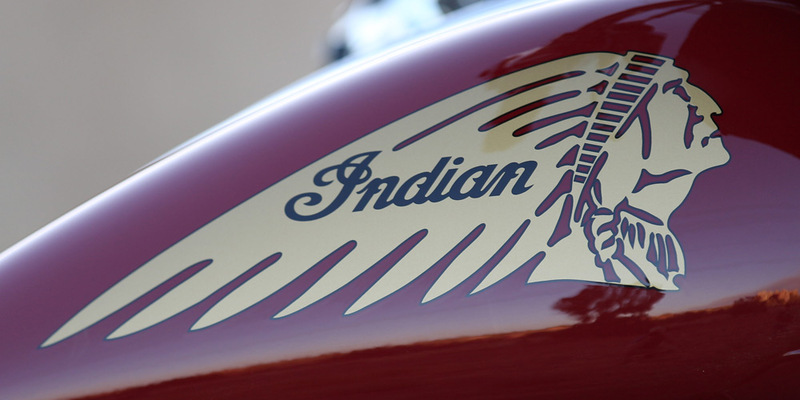 Certainly Indian® Motorcycle is here to stay. Seems like the only question now is just how large a foothold they will have in the industry. Above all else, one thing is clear – Indian® Motorcycle is in the fast lane now! Along with Vince, I am waiting to see what you come up with for the rear lights on the Roadmaster. I currently have the brake light flasher but one thing I would like to have is running, brake, and turn signals in the trunk lights. The more the better when it comes to safety!! Thank you for choosing Custom Dynamics® for your Indian®! We do currently offer our SMART Triple Play® for Indian® models. This module would convert the rear, single-intensity (turn-only) turn signals to function as running lights, brake lights and turn signals along with offering 10 user-selectable brake flash/strobe patterns! While we don’t currently have a similar module available to provide run/brake/turn functionality to the stock OEM Indian® Tour-Pak, we can always add you to our product request/wish list! That way, if the application is made available in the future, we can let you know! To be added, simply email erin@customdynamics.com with the year/model of your bike! Thank you again for choosing Custom Dynamics®, have a great week and ride safe! As everyone knows motorcycles are one of the most beautiful things on the road today, but they are one of the most overlooked as well. My bride and I are missionaries to bikers. Which means in part, we are on the road A LOT. Subsequently, we have seen many things out there. Some of which, have not been pleasant. Many of those tragedies could have obviously been avoided, by simply making the motorcycle more visible. I say all of that, to say this. We as riders, need to be seen as much as possible – right? As such, my bride and I are looking for a plug-n-play system that will make the stock turn signal lights on our 2016 Indian Vintage work as running, braking, as well as turning lights. There are companies out there that are making them available, but at GREAT cost. You see, they’ll offer what seems to be the perfect system, only to ambush you after the installation, with the fact that the system won’t work without purchasing their special RED LED tail light bulbs – all sold separately – which works out to be several hundred dollars. We get it. But WOW!!! Really?!?! We understand that some states get a little cranky about having a couple of small rear brake lights be amber. But for those of us that travel a lot on two wheels, our overwhelming concern is visibility. My bride rides our other bike (a 2006 Heritage Softail Classic) which has that feature, and uses the original amber lenses. We are always pleasantly surprised, when talking to members of law enforcement, how many understand and are willing to overlook the two little lights. Truth be known, they would MUCH rather have us be more visible, and thus more safe, than to have to scrape any of us off the highway. Besides, many of them ride as well – so they get it. Please forgive the length of this note, but as you can see, because of what we’ve seen and had to deal with out on the road, we are very passionate about making this happen. So if you can, please hurry and get a simple plug-n-play unit out there, that will fit our stock Indian motorcycles. And if you can, please make it reliable, and inexpensive. (If it doesn’t work right, and is cost prohibitive, then what would be the point. Right?) Also, the sooner, the better – so that more lives might be saved out there. Just sayin. Thank you so very much for your time, and especially all of your efforts. See you in the wind. Again, the module is plug and play and is backed by our 5 Year Manufacture Warranty! I know there is a lot of information to review online, so please feel free to let us know if you have additional questions or if we can help you place your order! To reach a Customer Service Representative, you can call 1-800-382-1388 (Business Hours: 8:30am – 5:30pm EST Monday – Thursday; Closed Noon – 1pm & 9:30am – 5:30pm EST Friday; Closed Noon – 1pm). Thank you again for considering Custom Dynamics®, have a wonderful week and ride safe! We do plan on offering products with fitment on Indian® Scout® models! If you’d like, we can add you to our Product Request/Wish list. That way, as soon as products for the Scout® models are available, we can let you know right away! Thank you for following up with us! We’ll add you to our product request/wish list now! That way, as soon as those products are available, we can let you know! Thank you again for choosing Custom Dynamics, have a wonderful afternoon and ride safe! I’m glad to hear your working on lighting mods for Indians, I’ve used your products on my previous Harley’s which were fantastic. I have now gone with Indian and was very surprised to hear at Bike Week 2018 there’s still no lights available for the Indians. They did say you are working on light currently, but nothing yet. First, thank you for your support and for continuing to choose Custom Dynamics! 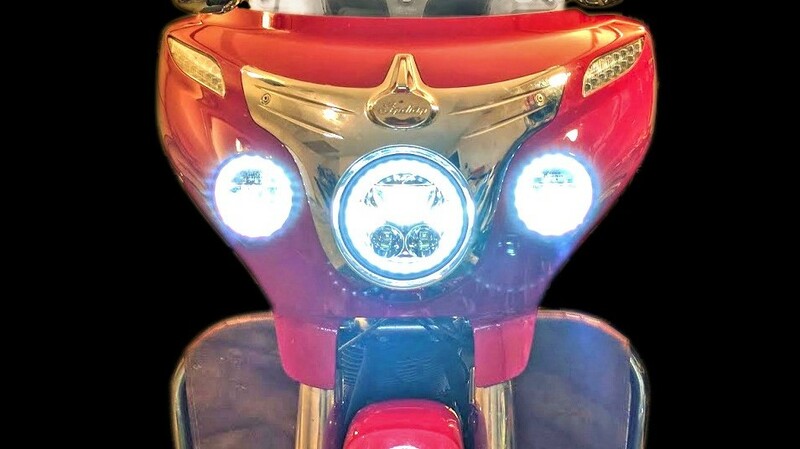 While we currently have LED Headlamps, LED Passing Lamps and a Magic Strobes Brake Light Flasher™ available for most 2014 and newer Indian models, the specific electrical system on those bikes required particular Product Research and Development work be done. If you’d like, we can add you to the product request/wish list – that way we can let you know as soon as additional LED Lighting options are available! With so many of our customers riding Indian models now, we are anxious to release more products for those bikes! Thank you again, and ride safe!